1 Double bedroom. 2 Twin bedrooms. Bedlinen and towels included. 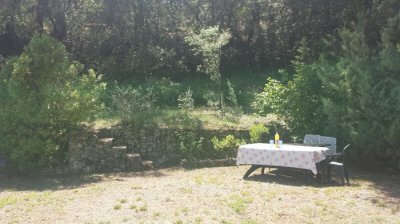 Description of Property: The house has plenty of parking, is secluded within a large garden and only 10 minutes walk from the centre of the village and 10 minutes drive from the more well known tourist villages of Cotignac and Entrecasteaux. There's a open fire in the living/dining room area, electric heaters throughout and a bath and shower. The TV has basic Sky and there's also a DVD player and WiFi. 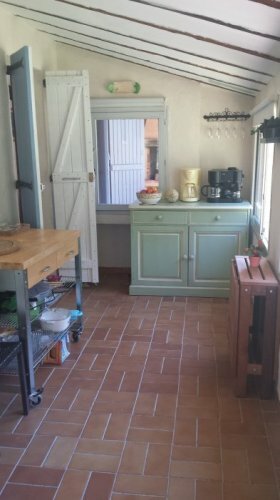 The open plan kitchen is small but well equipped with an electric oven and duel fuel hob as well as a dishwasher and washing machine. Outside Amenities: Large garden surrounding the house with a pool, outdoor kitchen with a charcoal barbecue, plenty of outdoor eating space and a large verandah. Surrounding Area: Carcès with its population of 2,500, is often described as a village but feels more like a small town with its two pretty squares, medieval quarter, cafes, shops, churches and the picturesque confluence of the Caramy and l'Argens rivers. Most of the restaurants stay open in winter. On Saturday mornings there's a good market selling local produce and textiles. Carcés feels like a real place; tourists do come and are welcomed but even at the height of summer there are few English, German or Dutch voices. The house and situation are ideal for anyone seeking a taste of authentic small town French life. 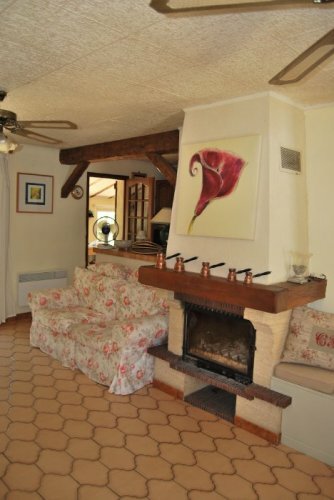 Electric heaters throughout, open fire. Mains water. Mains drainage. Electricity. WiFi Broadband Internet Access. Television. Satellite TV. DVD. Hi-fi. Pricing Info: Deposit of 800 euros and one month's rent in advance. Price includes wifi. Electricity, phone and wood are extra. Final clean, laundry bill as required and any outstanding costs will be deducted from the deposit.